Component template is one of template which is provided in SOA 12c template. In Part-1, we discuss about project template, how to create and how to use project templates in Jdeveloper 12c. This post is specific to component template. This template contains service component. It also contains all reference components and resources. It appears as a custom service component in the SOA composite application's Components window. E.g. a BPEL process which calls database adapter can be used as component template. Please note that this BPEL need not to be complied and need not to be complete. In this post, we will see how to create component template in Jdeveloper, how to add external component template in Jdeveloper and how to use component templates. We have created one sample BPEL component which will use to create component template. 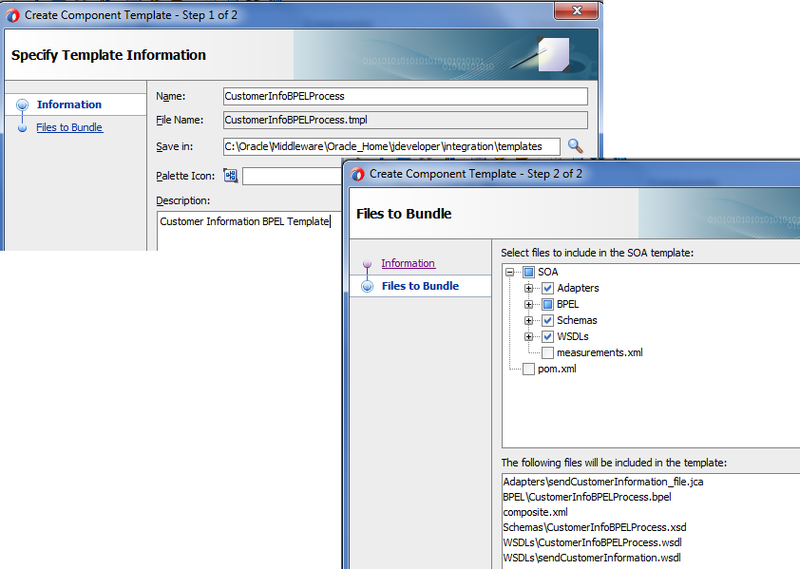 To create component template, right click on the component (BPEL) and choose “Create SOA Template”. 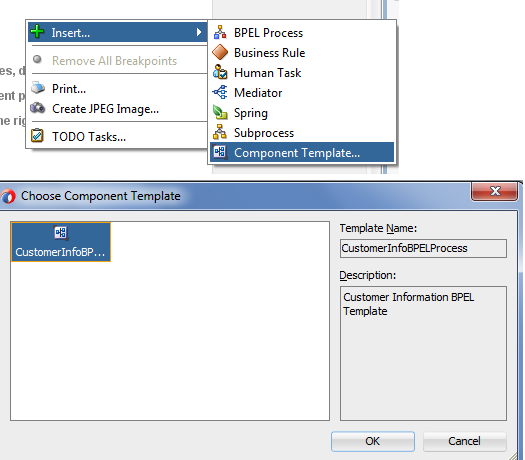 You can create template other available components but for this post, I choose BPEL component.. This open one wizard where we will specify template information, in step one change template name if you want to give some other name and also provide template description. Once done, click on next, in next step it shows all the files which are there inside this template, you can select the files which you want to include in component template and this show file summary in below pane. Click on finish, this will create component template for you. In previous step, we created one component template, but we can also use external component template. Before we use external component template, we need to add template location in Jdeveloper preferences. When we build component template from Jdeveloper then it automatically add required template path to Jdeveloper but we need to add this path manually when we need to use external build component templates. 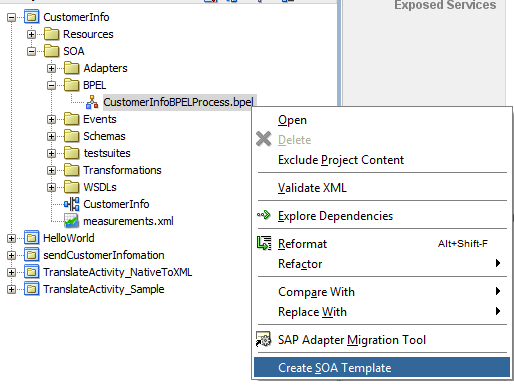 To add this path go to Tools à Preferences à SOA à Templates, Click on Component Template folder and add the required component template path. This will list all the component templates which are there under that location. We already saw how to create component template and how to add external template in Jdeveloper 12c. Now let’s see how to use this component template. 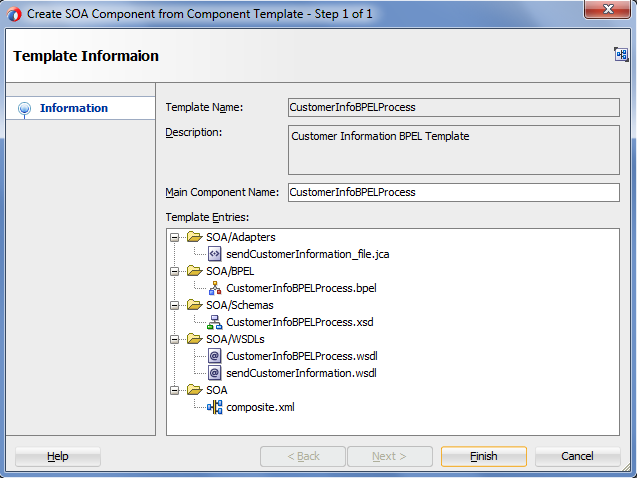 To use component template, first create a SOA composite. To add component template to it right click on the composite.xml and click on Insert and choose “Component Template”. It will enlist all available component templates. Choose required component template and click on Ok. Once you choose the component template, it also show description for that template. Once you click on ok, you will see template information along with template name and description it list all the files which will get imported to your project once you use this template, click on finish. You will see BPEL component gets added to your composite.